Before: This patient presented with an old 3-unit bridge. 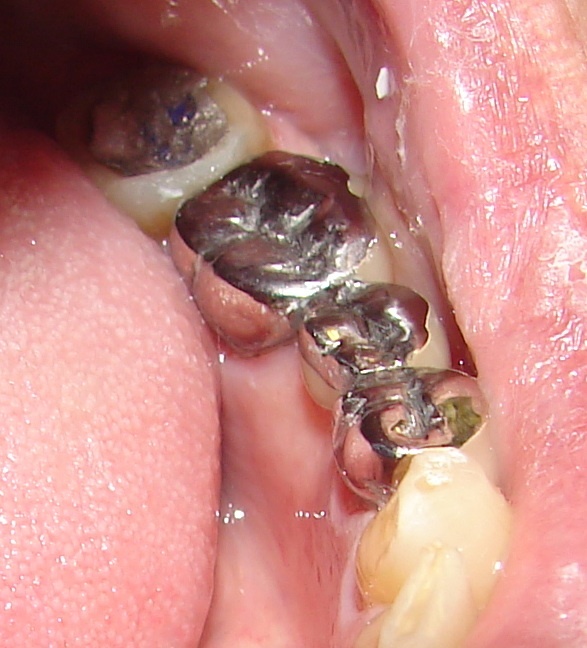 The porcelain had cracked and chipped off, causing food to trap between the teeth, irritating the gums underneath. The patient was a bruxer and would grind his teeth. The all-metal tooth of the bridge shows deep wear marks where the patient's top teeth literally ground through the metal! 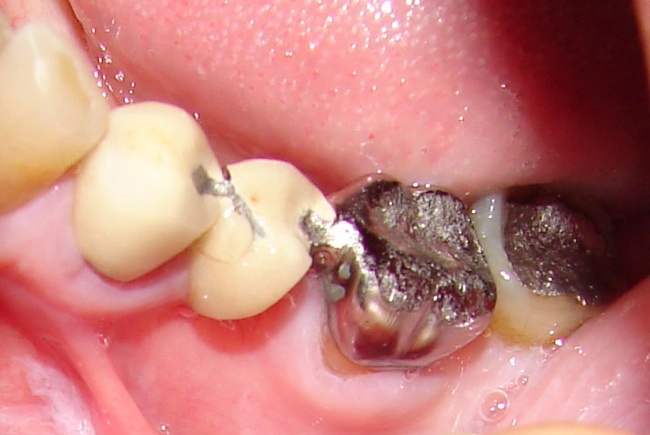 One problem with porcelain is that it can wear down teeth that bite into it, especially if a patient is a bruxer. After: In remaking the bridge, I chose to make the top, chewing part of the bridge entirely in metal. This prevents the patient from grinding off the more brittle porcelain, as happened in the previous bridge. Also, with no porcelain on the chewing part of the bridge, the teeth that bite and grind into the bridge will not be worn down. Porcelain may be more esthetic because it is white like natural tooth structure, but in a case like this, where the patient is a grinder, I chose to modify the bridge design to make it more compatible with the patient's specific situation. Nonetheless, in a few years the bridge may wear down again, requiring a re-make. To prevent this, I suggested to the patient that he have me make a nightguard for him. The nightguard is a hard acrylic overlay that fits over the top portions of the teeth, protecting the teeth from grinding forces.